I am so sorry I have been AWOL for sooooooooo long, I have no excuses. But I'm back, and hopefully for good again. I started the year with a resolution to make at least one card a day, and so far so good, although I admit a lot of them have been decoupage ones to start using up my very large stash of sheets (originally 8 A4 boxes of them). 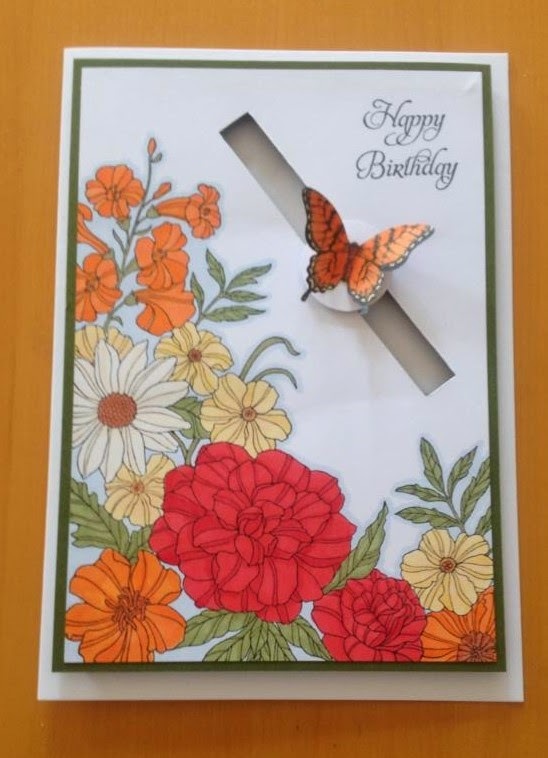 This card uses one of my favorite techniques,a penny slider, so the butterfly can whizz up and down visiting all the flowers. All the stamps are from Stampin' Up and have been coloured with my ProMarkers. Super card, love the spinning butterfly. Great strong colours on the flowers. Thanks for linking up with us over at Myshericrafts this week. What a beautiful slider card! Thanks for sharing it with us at My Sheri Crafts.